If you read my second blog about Banff, now I am going to cite the story about my third and last day tour in Banff. I had been so excited for the past two days of my tour in Banff, but the excitement that I have still not perished in my last day tour. The main reason why I am still excited, I am going to Columbia Icefield in Jasper. Ice and snow are the things that are not familiar to me because I am living in a tropical country. And I have been dreaming to experience snow or walk in ice. Before we went to Columbia Icefield, there were other interesting places we visit. While traveling along Icefield Parkway (or Highway 93) – a highway road that you can see both Banff and Jasper National Park, I am stunned because of the rocky mountains in each side of the road. Because of the scenic view I saw, I became a rocky mountain lover. While inside the tourist bus, I took a lot of pictures of rocky mountains and I can say that I shot my digital camera to all mountains that my eyes can see. I cannot stop myself to admire those rocky mountains. While on the road, we saw Crowfoot Glacier and I had been lucky because I captured a picture of it while inside the bus. Then, we stop over in Jimmy’s place. Before, I thought that was the real name of the lodge until I found out that it is the famous Num-Ti-Jah Lodge. in Icefield Parkway. The lodge was founded by Jimmy Simpson and it is located near in beautiful Bow Lake where you can see both Bow Glacier and Crowfoot Mountain. We had our hot chocolate inside the Num-Ti-Jah lodge and because of it we had a chance to view some of the arts and crafts created by Jimmy Simpson. We were also informed that the lodge was built by Jimmy with his own bare hands (based on history – he has no knowledge about building house and architecture) and that was really amazing. I also found out that the lodge will be probably become part of Canadian National Historic Site. After Num-Ti-Jah lodge, we traveled again. We stop at the side of the road and after I got myself out in the bus I was surprised because of panoramic view of Mount Chepren and Waterfowl Lake. Mount Chepren has its own distinct shapes compared to other rocky mountains and the Waterfowl Lake adds beauty to the mountain. Waterfowl lake is amazing too, I saw most part of it as icy water (same like Lake Louise and Moraine Lake). The next place we stop was where we had our lunch – the place was near in Saskatchewan River Crossing. We had our table where we were freely enjoyed the great view of North Saskatchewan River. I am wondering why it was called Saskatchewan River Crossing and I just found out from our guide that this great Canadian Heritage River is crossing other river such as Howse River and Mistaya River (but I never got a chance to see the other two rivers). While writing this blog, I remembered North Saskatchewan River is also the same river that I had chance to cruise in Edmonton (what a great surprise!!!). After lunch we went back to the bus and started to travel again. And the moment I have been waiting for had arrived, we were in Columbia Icefield Centre. After the bus came into halt, I picked my winter jacket, my gloves and my bonnet hat, then I went outside the bus and of course I looked around and I took pictures as much as I can. We waited for our tourist guide to park our minibus. Then, he led us to the bus driver that will send us to the area where we can transfer and ride an ice explorer. Ice explorer is big wheel vehicle that was made for ice exploration at the top of the glacier. When I saw the ice explorer or the snow coach vehicle, I am surprised because it is so huge, I remember that the wheel is almost the same of my height. And another surprise is that the vehicle can carry a lot of people. 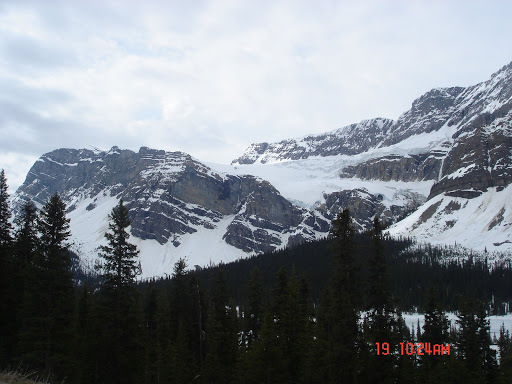 After I got myself onboard in the ice explorer, I got my digital cam on and I both took videos and pictures while on our way to the top of Athabasca Glacier. Ice exploration was one of the great memories I had in Jasper and Banff National Park. I am not fully aware how is the feeling while walking at the top of the glacier. Speaking of Athabasca Glacier, I have information that this is the friendliest glacier that people can take to be able to go to the Columbia Icefield. Some glaciers are meant for the adventure extremist but Athabasca Glacier are meant for all type of people. Few minutes passed, we arrived in the top of Athabasca Glacier. The feeling was so great after I got out the ice explorer. There are lots of people at the top of the glacier . I saw different kind of people such as children, young, adult and old ones, all were enjoying the scenery. And my dream came into reality, I was able to walk in the ice that really thrilled me. And I am so glad because of the thought that I was near in the middle of the Columbia Icefield through Althasbasca Glacier. Walking in the icefield was exciting, fun and scary but I had a great time. Some people got fall in the icefield ground because some part of it is slippery due to solid ice, but even that was the case, people were all enjoying. I chose the part of the icefield with snow, then I tried to picked some snow and I made snow ball. After I did that I felt that my hands got numb (because of it, now I understand the feeling in a cold place like glacier). The experience was worthy and I enjoyed Columbia Icefield ice exploration. You got some really cool pics of your trip into the Rockies. I also liked your pics of Banff and your trip to Vancouver and the Capilano Suspension bridge! Looks like you had a great time in Canada. Thanks for your visit to my blog.